COLUMBIA, Mo. –The number of ways to navigate the higher education system is sometimes daunting. According to the Department of Education, 23 percent of those attending community colleges in the U.S. transferred to four-year institutions, while 38 percent of those achieved an associate’s degree before transferring. The University of Missouri and the Missouri Community College Association Presidents and Chancellors Council are honoring their distinguished and successful mutual alumni, who graduated from one of Missouri’s community colleges and later from MU. “MU, the Missouri community colleges and other public and private colleges and universities in Missouri are incredibly important in the creation of social and human capital in Missouri—gaining access, the preparation of college graduates, finding better jobs, providing good incomes, raising families and providing community leaders in communities all across Missouri,” said Terry Barnes, assistant provost for community college partnerships for MU. Today, MU is showcasing the success of Missouri Community College alumni who later graduated from MU. Personal testimonies from these alumni illustrate their success, which has improved their communities. “All those celebrated have shown a common investment in public higher education, beginning at the community college level, followed by a degree from MU. These investments have paid dividends to both them and the state many times over,” UM system President Gary Forsee said. The presidents and chancellors of the Missouri Community College Association selected outstanding graduates from their community colleges, who later chose to attend and graduate from MU. More than 30 alumni are being recognized for their accomplishments. 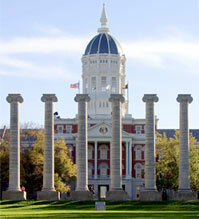 After earning their associate degrees, some may have gone on to Missouri’s regional universities, and later transferred to MU to finish a bachelor’s or other advanced degree. Others may have transferred to MU and later completed master’s, doctorate or professional law, medicine or veterinarian medicine degrees. “These successful alumni should inspire young people and help them understand that no matter the different starting points and paths taken, success comes from making a commitment to succeed,” Barnes said.